It’s nearly ten years since I visited the Disisa olive groves in the Monreale región of north western Sicily. I was impressed with the oil from these groves then and so I was very glad to see recently that the Disisa oil is now on sale on thegiftofoil webste. The name Disisa is derived from the Arabic for “splendid” and it is obvious why the land was so named! The farmhouse itself is built around a beautiful, traditional courtyard and has a terrace with a stunning view rolling for mile after mile into the very heart of the island’s rugged mountains. Dating back to Norman times, this ancient farm is owned by the Di Lorenzo Family. It covers 400 hectares of olive groves, vineyards for the production of wine and wine vinegars, along with orchards and herb gardens to grow the many different ingredients such as lemons, mint and basil used in the range of Disisa infused olive oils. The 50 hectares of olive groves are planted with old Biancolilla and Nocellara del Belice tres and newer Cerasuolo trees. The estate has its own Frantoio and bottling plant. This fresh and lightly crunchy pasta recipe makes a great summer dish. It uses local Caciocavallo cheese. Caciocavallo, means “cheese on horseback” and it gets its name from the manner in which the cheese is tied together in a rope and dangled over a wooden board to drain and mature. If you cannot find Caciocavello use Parmesan instead. Cook the spaghetti in a large pan of boiling salted water until ‘al dente’. In a separate pan cook the sliced courgettes in plenty of Disisa olive oil until the slices just begin to soften. There should still be a slight crunchy bite. 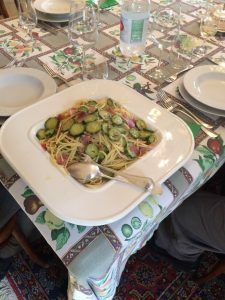 Once the spaghetti is cooked, drain well and add to the pan with the courgettes, adding in the very thinly sliced ham. Toss together with plenty more of the olive oil, and grate over lots of the local ‘Caciocavallo’ cheese. Add a good deal of black pepper and a little salt if required and serve at once.